The latest production from the well-loved television series Black Mirror, let loose on the streaming platform Netflix, is a ‘choose your own adventure’ style film where the audience can interact with the plot development by picking what to do at critical (and sometimes not so critical) points. Bandersnatch joins the trend of using modernist and brutalist architecture as locations in visual media. The location scout and production crew preferred spaces that will be familiar to modernist architecture enthusiasts; the bleakness equally attributed to both British modernist and post-war brutalist architecture and Black Mirror must have made the decisions easy. Our protagonist Stefan Butler’s and his father’s house, Saint Juniper Medical Practice where Stefan’s psychiatrist works, the shopping parade/public space that houses an 80s WHSmith, the high rise office building where the game developer firm Tuckersoft’s offices are and the flat of another game developer Colin Ritman are the most prominent examples of modernist architecture in Bandersnatch. Finsbury Health Centre (psychiatrist’s office, Saint Juniper’s Medical Practice). Located in Islington, this grade I listed idealist health centre was designed by Berthold Lubetkin/Tecton Group in 1935-38. According to John Allan, it is 'modern architecture’s most important single achievement in England in the first half of the 20th century.' It was the proposed solution for an unhealthy public who lived mostly in slums in overcrowded Finsbury in the 30s. It is a successful example of how architecture can respond to and influence social and political issues of its day. Furthermore, it is one of the first attempts of collecting all health services in one location instead of them being scattered all over town. The design has a very innovative approach for its time; the influence of rational thought can be clearly seen in the plan and function organisation. It very much showcases Lubetkin’s political and social notions and his constructivist education. The idealism behind its design can also be seen as a foreshadowing of the NHS, now underfunded and threatened with privatisation. With an H shaped plan, this two-story building has its treatment rooms positioned on the ground floor wings, to allow ease of access for patients, eliminating climbing stairs. It has a welcoming, open-armed form, and the curved façades of the outer wings let a generous amount of daylight in. Although a concrete structure, Finsbury Health Centre has glass block front façades which again create a bright space in the entrance hall and contrast with the general notion of hospitals and medical spaces being dark and unpleasant. Rather, the health centre welcomes any patient with feelings of comfort and positivity. Saint Juniper’s Medical Practice where Stefan meets his psychiatrist. Black Mirror: Bandersnatch, screenshot, 2018. 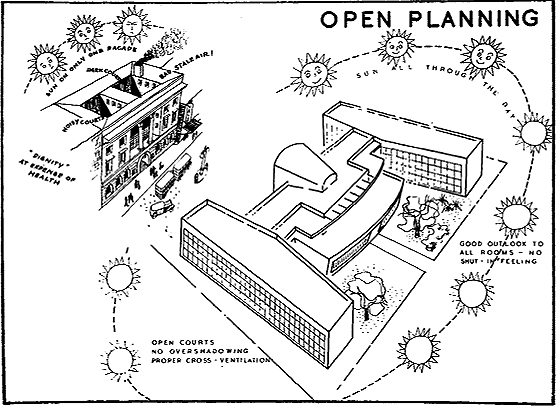 A cartoon which emphasises the design element of natural light. Image credit: Gordon Cullen, Save Finsbury Health Centre. Trellick Tower is a Grade II listed social housing project in Kensal Town. Designed by Ernő Goldfinger, this 31 storey building with a 7 storey addition that contains shops and amenities, both connected to the same service tower, was completed in 1972. This date corresponds to a time when social housing projects were in social and physical decline. Trellick Tower shared this same fate from the start, with stereotypical council housing behaviour such as crime, drug use, vandalism and lack of maintenance occurring on the premises. It was thus dubbed 'Tower of Terror' and remained so until the 90s when its image transformed to being admired by the public.. Sharing a similar design with its older sibling Balfron Tower in Poplar, Trellick Tower’s circulation and service areas are collected in a separate tower, allowing the floor plans to consist of an increased number of more spacious flats. The use of concrete — its colour and texture — the ratio of open and closed volumes of the façade, cantilevered balconies, perceived movement of vertical and horizontal elements and the majesty of the structure as a whole are a few reasons why this design is frequently used in visual media. Black Mirror: Bandersnatch, screenshot, 2018. Nicknamed 'The Threepenny Bit', 'The 50p Building' or 'The Wedding Cake' by locals, this 24 storey office building completed in 1970 is by Richard Seifert, who also designed London’s Centre Point. In Bandersnatch, it serves as the headquarters for the game developing firm Tuckersoft. This modernist building located next to East Croydon Station is eye-catching and unique with its indented façade and sharp lines. The architect was not fond of right angles, so the building has an octagonal floor plan, with each floor juxtaposed over the other at a 45-degree angle. Because the indoor spaces are not speckled frequently with columns, implementing an open plan office in this building is quite easy. Today, it has a monumental presence in the town centre. Stefan takes in the glory of Tuckersoft’s building. Black Mirror: Bandersnatch, screenshot, 2018. Designed by Alison and Peter Smithson, best known as the architects of Robin Hood Gardens (now undergoing demolition), Sugden House was built in 1956 and is located in Watford, Hertfordshire. It was commissioned by Derek and Jean Sugden, who also contributed to the design process. Their wish 'for a simple house, an ordinary house, but that this should not exclude it from being a radical house' shaped the design. The space is minimal but effective with its exposed concrete beams, London brick walls, and pinewood joists. The open plan living space on the ground floor has wide glass openings, allowing it to be filled with natural light. The upper level has bedrooms, some with inverse L shaped windows that face a large garden. The slope of the roof is legible from the inside and minor level changes on the interior define the space by its function and create variety. Stefan’s house. Black Mirror: Bandersnatch, screenshot, 2018. Living space of Sugden House. Image credit: The Modern House. This private house is an intriguing choice for Bandersnatch; it seems like a space that an upper-middle-class family would possess. By choosing this design, Stefan’s interest in videogame development or him having access to therapy becomes more plausible. Similarly fitting one of the plotlines, the government may have assigned the building for the ‘program and control’ project. Another reason Sugden House may have appealed to producers may be its spacious, calm and organised feel, which is in sharp contrast to Stefan’s psyche and his eventual nervous breakdown (imposed on him by the viewer). St. George’s Walk, a partially covered shopping parade / public space, is located in central Croydon and was designed by Ronald Ward & Partners in 1964. Experts suggest that the regeneration of Croydon in the 60s was lacking in planning; the skyscrapers were dotted around town without considering the spatial experience of the ground level, causing it to be of poor quality. Designing a town centre only as a commercial hub ignores the local community’s spatial needs. A design approach lacking integrated planning is expectedly not sustainable. The area today is covered with “empty concrete canyons”, St George’s Walk being one of them. It is a rather bland space covered with a thin concrete slab, one side completely with a skylight, the other (used in Bandersnatch) covered partially and speckled with a few green elements. Today, it is not actively used; most shops are closed and demolition is imminent. Although rendered very 80s in the film, the detachment of the modern user from this space is still perceivable. It does not affect the story at all, it is just a shopfront, a place where Stefan goes to buy books and vinyl. St. George’s Walk. Image credit: Google Earth. St. George’s Walk in the Black Mirror universe. Black Mirror: Bandersnatch, screenshot, 2018. Words by Serra Aşkın, architect and writer. The article was originally published in Turkish in Manifold, January 2019. For more information, visit the reference list.